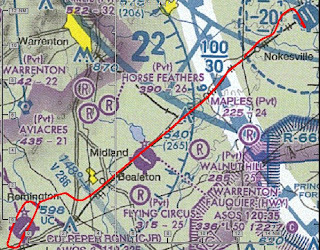 On Saturday, November 20, I flew Lesson 23 from the Jeppesen syllabus. This was a dual review flight to work on executing the maneuvers to better than PTS minimums in preparation for the checkride. It was a beautiful morning, and they had put the airplane in the hangar overnight so that it would be easy to start. During preflight, I got a slug of water in the bottom of the fuel tester from the fuel strainer drain. This was a first, and now I know what water will look like in the tester. After a couple more refills of the fuel tester, it was clear of water. The engine ran really rough for the first few minutes, but eventually smoothed out. I executed a soft-field takeoff that was not bad--I'm over with not pushing the nose down enough when in ground-effect. We flew out around the greenhouse and I executed a simulated engine-out landing on a grass strip next to it (we aborted the landing at about 500 feet AGL). I definitely had the field made, but I probably added flaps too soon. Next was slow flight. I forgot to do my clearing turn first: that would have busted the checkride. After the clearing turn, I slowed the airplane to minimum controllable airspeed with the stall horn blaring the entire time. I think this was within PTS, but it is definitely something I want to keep practicing. Then power-on stalls. These were passable, but I still took forever to induce the stall break. Power-off stalls were OK. Steep turns caused me some trouble. I was over-controlling. There was definitely some rust to knock off, since I hadn't done one of these in over a month. 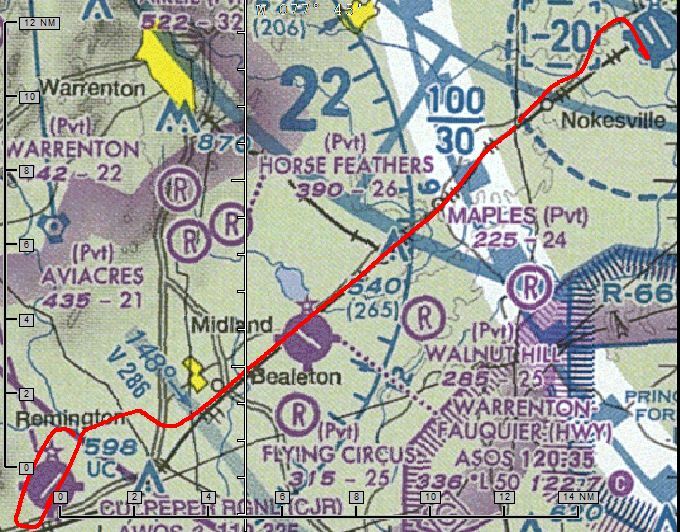 We flew to Culpeper and I tried to forward slip in to runway 4 on final. I was a little high, so I decided to go-around instead of landing long. On the next circuit, I briefly let the nosewheel touch on my soft-field landing. I did another soft-field takeoff and flew back to HEF. If I can get my act together, I have a few more review flights before attempting the final test to be signed-off for the checkride. I had my CFI renew my 90-day solo endorsement so that I could get more practice in, if needed. My goal is to get the checkride knocked out before New Years.